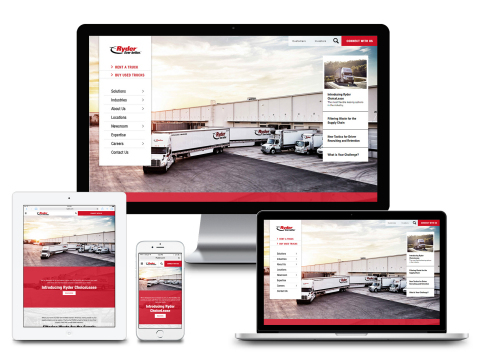 Ryder System, Inc. (NYSE:R), a leader in commercial fleet management, dedicated transportation, and supply chain solutions, today announced the launch of its rebranded, fully responsive website, Ryder.com. The new layout, featuring reorganized content, makes it easier to navigate the site from any device, and ultimately, to do business with Ryder. "Ryder is continuously looking for ways to create and deliver the best customer experience possible," said Karen Jones, Executive Vice President and Chief Marketing Officer, Ryder. "We want to make it as easy as possible for visitors to get the information they need about the best Ryder solution, both when and how they need it and across any device." The fully refreshed site serves up a "Problem Solver" feature, which allows visitors to easily identify the business challenges they are facing and pinpoint which Ryder solutions can help them to address those challenges accordingly. This tool specifically helps prospects and customers understand the benefits of outsourcing transportation and supply chain operations. With the new homepage layout, tasks are made simple, such as buying or renting a truck, searching for Ryder locations, and identifying industries and solutions for supply chain and logistics needs. A background canvas video that illustrates Ryder's capabilities immediately plays on the homepage, where visitors are also able to obtain access to highlighted content and pages. Additionally, the new site has made it easier for those seeking a career at Ryder to learn about all available job opportunities within the Company. The new Expertise page is one in particular that can help any visitor conducting research on Ryder's transportation and supply chain solutions. This section provides access to real-world examples of Ryder's capabilities through case studies, customer testimonials, videos, brochures, special reports, and more. The website was developed in partnership with Crispin Porter + Bogusky (CP+B), a leading advertising and digital agency known for strategic thinking and breakthrough creativity. The agency's global client list includes companies such as Kraft, Infiniti, Domino's Pizza, letgo, Fruit of the Loom, Hotels.com, and American Airlines. A thorough analysis of Ryder.com's user activity revealed just how important it was for the site to be fully responsive and mobile-friendly, with mobile traffic doubling over the past two years and constituting nearly 50 percent of its traffic. Findings from the analysis also enabled the Company to identify the most frequently visited pages and to create rich, easy-to-digest content on those pages. In addition to Ryder.com, the Company plans to launch redesigned versions of its Rental and Pre-Owned Vehicle Sales websites later this year. This will make the mobile experience seamless and provide the most user friendly platform in the industry for commercial rental and sales. To access Ryder's new online experience, simply visit ryder.com from your desktop or mobile device.